Our Results - Panariagroup Industrie Ceramiche S.p.A. The initiatives enacted and the results achieved in 2017 (period going from January 1st to December 31st) by the Group in the field of sustainability. Panariagroup closed the 2017 financial year with net income of €11.3m and turnover of €385m (a plus of 9%, which is also the average growth rate of sales over the last three years). These are convincing figures, the result of winning strategic choices such as the gradual process of internationalization, a broad and diversified product range, the capillary sales organization and investment in technological innovation in manufacturing. An EBITDA of €42.7m, with constant growth over the last five years, underlines the ability to generate wealth through the operations management. Always in a close relationship with the areas it operates in but also focused on national and international dynamics, the Group – thanks to its presence on the stock market – is always aware of its responsibility towards its shareholders, actual and future, and financial institutions. 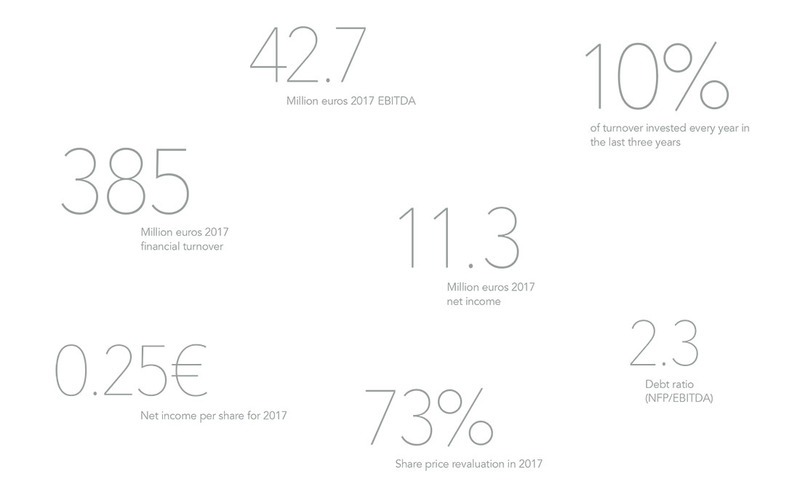 The earning per share in 2017 is 0.25 Euro while the ratio between Net Financial Situation and Gross Operating Margin is 2.33 thus proving the sustainability of the finances of the Group. 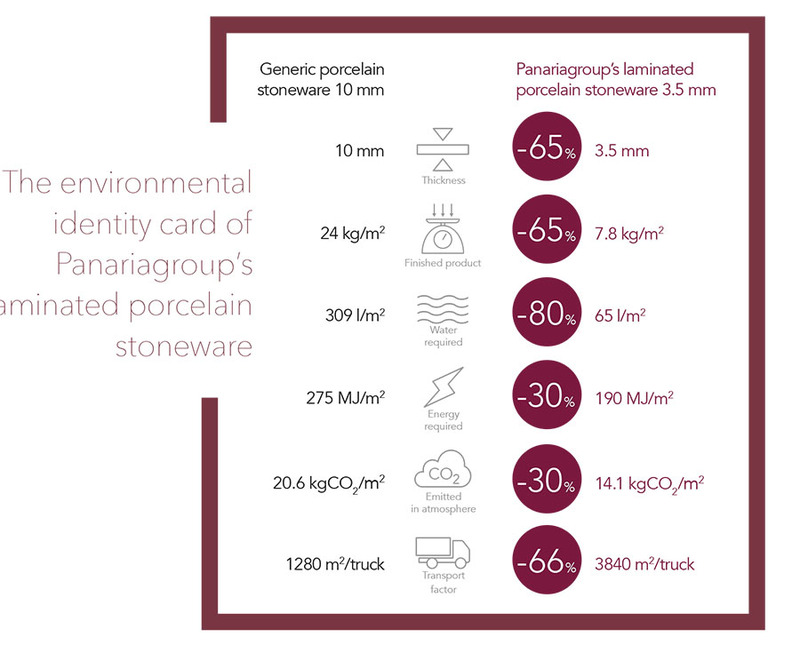 Technological innovation is the key for Panariagroup to reach new targets in the production of porcelain stoneware tiles and for what concerns the environment. Development and evolution of the production lines, continuous research, excellence in the choice of raw materials, variety and richness in the surface applications are a constant process and a daily challenge. Challenges such as having vision and investing on innovative technologies like laminated porcelain stoneware, product that not only created a new way of conceiving tiles, allowing their use in ways that until only a few years ago were considered unthinkable, but that also is a clear display of how to innovate a product with a strong focus on sustainability, thanks to a lower use of raw material and resources. Another clear example of the Group’s innovative ability is PROTECT, the exclusive line of antibacterial floor and wall covering developed in collaboration with Microban®, a world leader in hygienic technologies. PROTECT surfaces guarantee extremely high performances thanks to an antibacterial shield incorporated in the ceramic product, eliminating up to 99.9% of bacteria from the surface. Aware that, in the sector of the production of porcelain stoneware for flooring and wall covering, environmental awareness is more and more a critical factor for success, the Group was able to display, year after year, a true green philosophy that comes through at every level. In 2017 Panariagroup began the process of transitioning the quality and environmental management systems to the respective new ISO 9001: 2015 and ISO 14001: 2015 standards. Raw materials used in the manufacturing plants are constantly monitored, in full respect of the environmental standards set by the law. Equally, the production waste is mostly reused thus causing a diminution in the use of natural raw materials. It is important to highlight how the Panariagroup production plants in Italy reutilise 100% of the water in the process. This allows the Company to reduce the consumption of natural water resources by up to 80%. Panariagroup constantly invests in improving energy efficiency in its plants. 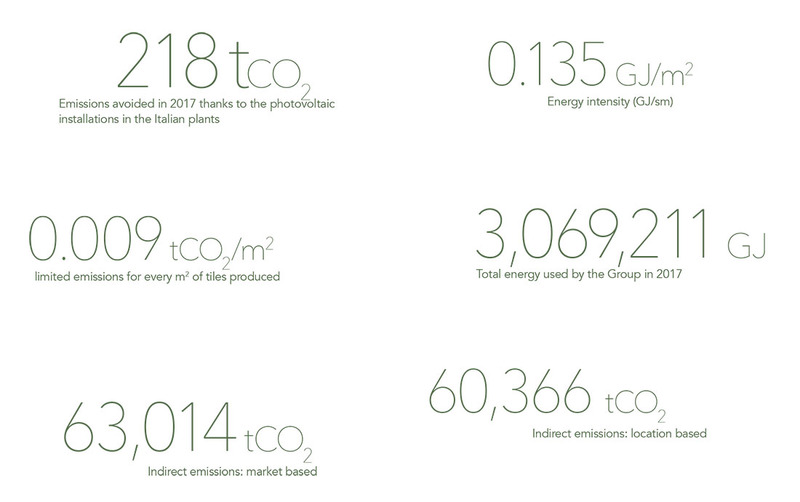 In 2017, the Group consumed 2,095 GJ from renewable sources and its Italian plants produced electric energy for internal consumption and reduction of CO2 emissions. Thanks to these systems, the Group avoided emissions of 218 tons of CO2 in 2017, an increase of 14% compared to 2016. 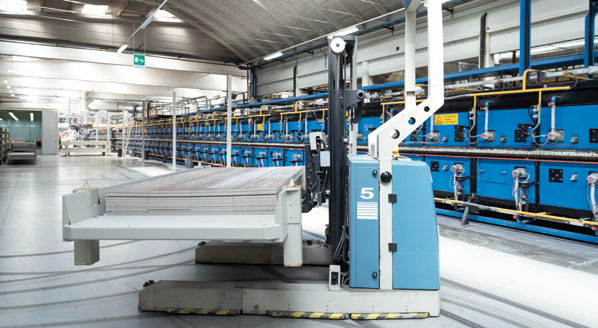 Moreover, the production of laminated porcelain stoneware – the product on which the Group has strongly invested during the last years – requires less energy and has less environmental impact in terms of CO2 emitted. Most of the waste produced, about 87,234 tons including 82 tons of dangerous waste, was destined for recovery. In fact, 93% of waste produced was recovered, a very high percentage. By contrast, only a small part was destined for disposal. 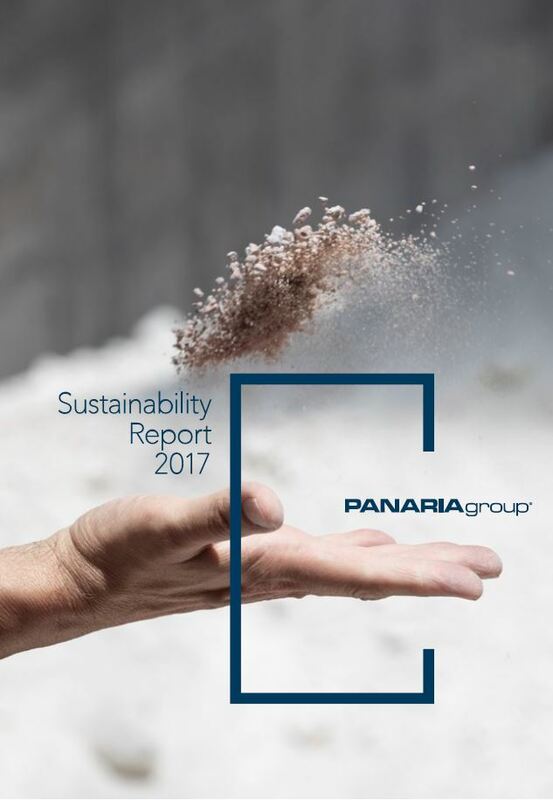 Taking into account the increase in production recorded in 2017, the Panariagroup did not register a significant increase in waste production, thanks to the high percentage of material recovered and the efficient use of raw materials throughout all the production processes. One of the core values of the Panariagroup is to always make people and their quality of life the center of our attention and to have the utmost respect for those who work with the Group. It is precisely the people, their well-being, their growth and their professional development that is the key to the Panariagroup’s success. Operating in a complex economic environment, the Panariagroup has decided until now to maintain stable employment levels and solid relations with the local communities in which it operates, both fundamental elements in responsibly maintaining the Group’s economic growth. The Group almost exclusively employs permanent staff. This type of contract that guarantees employees more stability and greater opportunities for professional growth. As of December 31, 2017, the Group employed 1,729 staff, up 2.6% on the previous year. 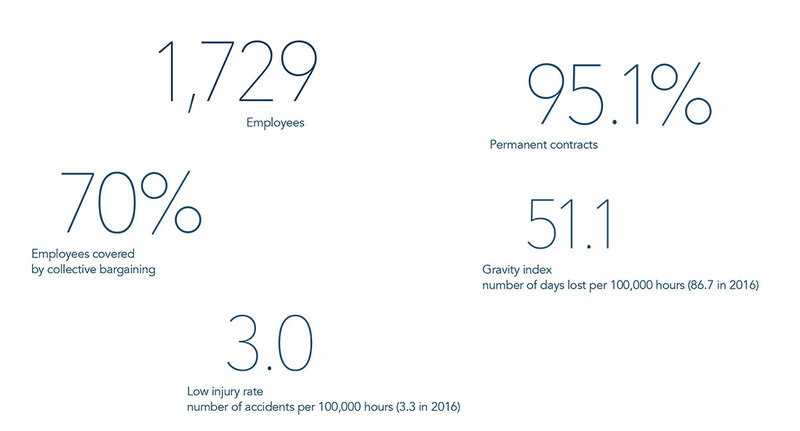 Against the background of a growing workforce, the Group’s turnover between 2016 and 2017 remained almost stable. The number of new employees increased, particularly in the United States, in line with the development policy of the Group. It is also worth considering that the Panariagroup is committed to ensuring equal opportunities for employees and for those applying to become part of the organization. Creating a motivating work environment and a sense of community is one of the key objectives to make every single employee feel an integral part of the organization. To this effect, various initiatives and activities in the plants in Portugal and the USA were aimed at strengthening the sense of belonging and endorsing employees as key elements of the Group. In Italy, through a welfare system, the Group guarantees its employees support not only in terms of money but also with further benefits. Education and professional development are fundamental aspects for the Group, with the aim to develop skills and increase knowledge. For this reason, the Group companies analyze workers’ specific needs on an annual basis, in order to guarantee the delivery of the training activities that are best suited to them and to the operational requirements. Panariagroup implemented an integrated system of Quality, Environment, Hygiene and Safety Management in order to guarantee the protection and the safety of its employees. Sustainability also includes relations with the local communities and associations in the territory that the Company actively support through donations and sponsorships. The Panariagroup aims to strengthen relations with its suppliers so as to jointly create a system committed to sustainability throughout the whole value chain. Recognising the importance of giving value to local economies the Group favours carefully selected local suppliers. In 2017, the Group continued its program of innovation, improvement and increasing efficiency at the industrial plants. The most significant investment concerned the Portuguese Business Unit with the installation of a new complete line at the Aveiro plant, made to the most advanced industry standards in terms of productivity, automation and energy efficiency. In addition to increasing the production capacity, the new plant, due to its design, is particularly suitable for the production of traditional large-format stoneware, both floor and wall tiles, which makes the range of our Portuguese Brands more complete and competitive. The expansion of the Portuguese site, supports the strong growth of the local Business Unit, but aims above all to further enhance its strategic function as a manufacturing hub for all the Panariagroup Brands. In the Italian Business Unit, at the Fiorano Modenese factory, to complete the important investment made in the previous year concerning the installation of the third line for laminated porcelain stoneware, new product finishing lines were installed for cutting, grinding, polishing and matting, which further increases the range of this type of products in a market that is still expanding. With reference to the innovative "Industry 4.0" program, it should be noted that a part of the investments made in the Italian plants already has technical characteristics in line with these standards; in 2018 we will continue to invest further and implement an interconnection, which is the key to this technological transformation. Also in the US Business Unit, at the Lawrenceburg plant, in line with the objective of increasing the volume of business and with a view to improving the efficiency of logistics and customer service, considerable work has been carried out to enlarge the buildings and to the rationalize the storage and shipping areas of the "National Distribution Center", which began operations in February 2017. Furthermore, concerning the USA, we would like to highlight the creation of a new Research Laboratory, at the Lawrenceburg site, which is purpose-built for the new product range development. In this way, the Group is working to further strengthen the Product Development function, which we believe is of vital importance for this market segment, and to structure a fixed procedure, centrally defined and valid for the entire Group, which, through detailed market analysis and the understanding of new trends in technology and aesthetics, aims at creating products that are more and more responsive to customer needs. Still in the organizational area, starting in the second half of 2017, the Group set up a commercial division dedicated to large projects, consisting of a team of consultants and a team of salesmen, able to interface with architects and designers and assist them in finding solutions, techniques and aesthetics using ceramic material, not only for traditional flooring and covering, but also in highly technical applications such as ventilated facades, floating floors, furniture tops, etc. Working alongside this Division, is a project support team, made up of a group of technicians, researchers and engineers, operating with the aim of better capturing opportunities in this particular market segment, where the traditional retail channels are not usually used, but which requires direct dialogue with major customers. Today the Group is one of the world’s leading companies in the ceramic sector, in terms of internationalization, technology, ability to interpret market trends and corporate management. The medium to long term strategy is aimed at continuing to be among the key players in the market; this is why it is essential to affirm the ability to embrace new technologies, product innovation, new markets and the strong sense of values and excellence which Italian ceramics have always represented. Ceramics are increasingly becoming a "universal" material, with a remarkable widening of the ways in which they can be used, compared to the traditional ways. The qualitative, technical and aesthetic characteristics, and its competitive cost, make it an interesting material for purposes where in the past other types of products were used, for example "outdoor" flooring, kitchen tops and, more generally, as a substitute for marble, natural stone and wood for many other uses. These trends, which are emerging very clearly, and from which we expect to benefit in the coming years, further encourage the company to continue with its planned growth strategies. Acting responsibly also means analyzing the sector in which we operate. The construction sector is intrinsically high impact, in terms of energy consumption, use of raw materials, water and land, waste generation and also CO2 emissions. This is an important factor that, if not properly managed and addressed, leads to serious consequences for the environment and the world we live in. Consider that, for example, in Europe from 2030 architects, in addition to the Energy Performance Certificates, will have to choose construction materials and techniques according to their environmental impact. Therefore, without eco-friendly building materials, sustainable buildings cannot be built. In this sense, not all building materials are equal. Ceramics (and stoneware) materials have long been used for building, thanks to their high durability, strength and expressive capacity. But ceramics are also important for having an achievable lower environmental impact. The most common measurement for this superior quality of ceramics is embodied energy. This measurement indicates the amount of energy used throughout the whole lifecycle of a product or service. The Panariagroup’s porcelain stoneware and laminated porcelain stoneware are much more long-lived than any other tiling and cladding materials. For this reason, even from an energy consumption point of view, in the long term they are even more energy efficient than materials that use less energy in the production phase, such as carpets. If we assume that a carpet must be replaced every 20 years, after sixty years it will have consumed three times the energy necessary to produce it; on the other hand, after the same period of time, the Panariagroup’s porcelain stoneware and laminated porcelain will still be in excellent condition. Porcelain stoneware and laminated porcelain stoneware are very long-lasting materials: they last as long as the building in which they are installed, more than any other covering material. At the end of its lifecycle, porcelain stoneware can also be completely recycled for a building foundation or for road works, or easily disposed of like any other inert material. The production of porcelain stoneware uses less energy in comparison to most other covering materials (parquet, natural stone, cork). For this reason, and thanks also to modern production facilities and its very high durability over time, our porcelain stoneware emits less CO2 per square meter of product. The photovoltaic systems installed on the roofs of the Group's plants also make it possible to reduce the electricity needs of the production plants. As well as the very high aesthetic and quality standards, natural resources are safeguarded by these eco-friendly products, most of which contain at least 40% of recycled raw materials. The Panariagroup’s commitment to the protection of the environment and the conservation of natural resources is particularly expressed in the management of production systems, which is aimed at prevention and minimization of environmental impact. In order to improve its environmental performance, the Panariagroup has implemented several initiatives and projects that have achieved important results. The following are some of the main activities carried out in the Italian plants relating to the optimization of the packaging process and to energy efficiency. 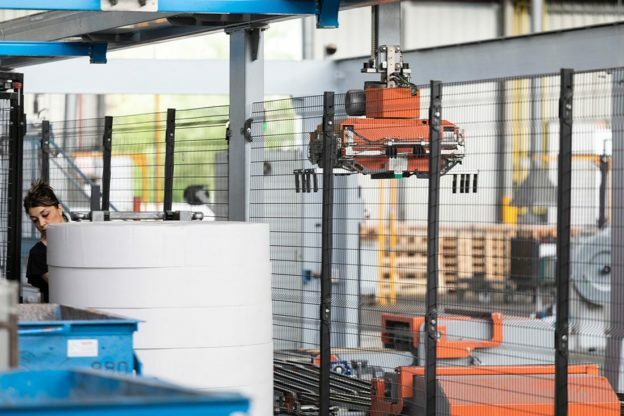 In 2017, a strong focus was placed on reducing the environmental impacts in the packaging system in terms of purchasing recycled material and efficiency of the resources in the packaging process, thanks to the introduction of automatic boxing machines in the sorting lines within the production process. In particular, 57% of plastic purchased this year was recycled plastic for industrial use, compared with 40% in 2016, and 100% of paper and cardboard for product packaging purchased was recycled paper and cardboard. In both cases, the Panariagroup is committed to the retrieval of waste materials which are recycled and reused. Moreover, in recent years the company has acquired new automatic boxing machines which permit the use of cardboard during the packaging process to be optimized, thanks to the use of a thinner paper and cardboard and the reduction of waste. The machinery wraps the product, adjusting the size of the material used accordingly. This technology allows a reduction of up to 50% of cardboard used compared to previously used systems. Finally, in 2017 there was a reduction in the use of wood thanks to a process of optimization of the palletizing system which, in some cases, even allows double the quantity of finished products to be packed on a single pallet. In line with the targets for environmental impact reduction and with the aim of reducing electricity consumption, the Panariagroup started a project for the replacement of all fluorescent neon lights used in the Italian plants. In 2017 the Finale Emilia plant finished the project by replacing neon lights with LED lights, registering through special meters an electrical energy saving of 50%. Every 4 months, Grès Panaria Portugal chooses the best employee, namely the one who has distinguished himself or herself for having achieved a certain goal, for having completed an important company project, or for merit. In addition, the employee of the year is elected at the Christmas party. These awards are communicated internally in the two Group’s plants and are accompanied by a monetary bonus. With the aim of increasing the sense of belonging within the Group, Grès Panaria Portugal is committed to employees’ visibility and organizes interviews that are published within the internal communication channels (intranet, bulletin boards in the factory, internal publications) in which the interviewee describes their life, their career path, their hobbies, their expectations and so on. Over time, this initiative has led to the development of a greater sense of community within the Group. In order to have an opportunity for team building, Grès Panaria Portugal organizes one day every year aimed at all employees, in which fun activities have been carried out, group exercises with the aim of building and reinforcing a mutual sense of belonging among colleagues. Apart from this, in 2017 a company climate survey was carried out to find out what employees think and to identify strengths and also areas where Grès Panaria Portugal can commit to improvement. The survey targeted employee feedback in 5 areas: Health and Safety, Environment, Internal Relations, Innovation and Quality, Recognition and Business Climate. The main results highlighted the Group's strengths. Here the company’s workers named the Environment, Quality and Innovation, while the company’s managers named Work, People and Products for the company’s managers. The areas for improvement that emerged were: respect, communications, equality and collaboration between employees. Florida Tile offers the services of a nutritional expert from Edumedics Wellness free of charge to all its employees. In training sessions and private visits, it is possible to get advice on food and diet. However, the aim here is not just about finding a suitable diet, but also about finding out about a healthy, balanced lifestyle. The Edumedics Wellness plan gives Florida Tile staff the opportunity to take part in a special program designed to raise awareness of and to improve personal performance in important issues such as personal health, physical wellbeing, weight loss – as well as bad habits such as smoking. The program includes the option of visits and checks by a specially assigned, registered nurse. With a monthly newsletter, Florida Tile is committed to sharing information on health and well-being, in order to raise awareness among its employees on specific topics such as breast cancer, the importance of checkups and ways to decrease the risk of developing it. Mindful that people are the key to achieving economic, social and environmental objectives, the Panariagroup constantly endeavors to improve the well-being of those who work daily in the Group’s factories and offices. In this regard, this year the Panariagroup Italia has decided to renew its corporate welfare system with the aim of implementing benefits and providing services more suited to meeting the needs of employees. To this effect, the Group has extended its care not only to employees themselves, but also to their families, with the idea of providing "all-round" support for fundamental needs such as education, family and health. Through a welfare system, the Group wants to guarantee its employees support not only in terms of money but also with further benefits. 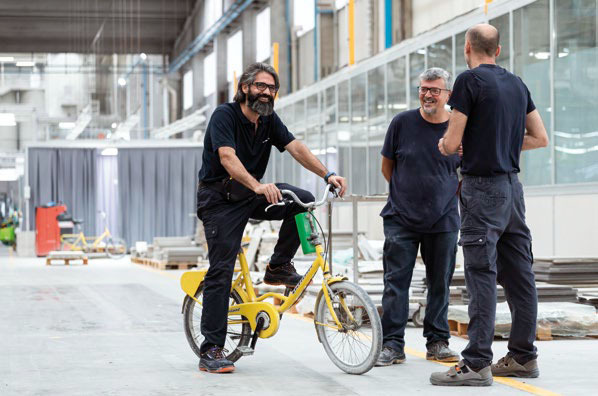 In Italy, the Group has devised a welfare system, in agreement with the employees’ representatives with whom it actively maintains an ongoing dialogue. In 2016, meetings were started with the employees’ representatives of all five Italian plants with the aim of renewing the additional contracts in which the services and benefits linked to the welfare system are defined. • fuel vouchers for all employees who live more than 5 kilometers from their place of work (the value of these vouchers is calculated in proportion to the distance), excluding those who have company cars. In addition, the welfare system also includes the company canteen service, aimed at all employees, with agreements with restaurants, canteens and bars near the plants and the distribution of special luncheon vouchers.